← Not losing weight through running? Thursday morning and I’d arranged to meet Gill at 630 for a 5 mile run from Bellahouston. A good reason for me to get out of my bed! If you struggle getting out of bed in the morning for a run, arrange to meet someone for a run. You’ll definately get up so because you can’t let them down. Gill is getting back into running after a bit of time off it. She wants to build up to increase her speed and aims to do the Glasgow half marathon in September. When I was training for the marathon I offered to go running with Gill, but she was worried she would slow me down, and said we’d wait until after my marathon. I kept telling her I didn’t mind what pace we did and we’d run at her pace. 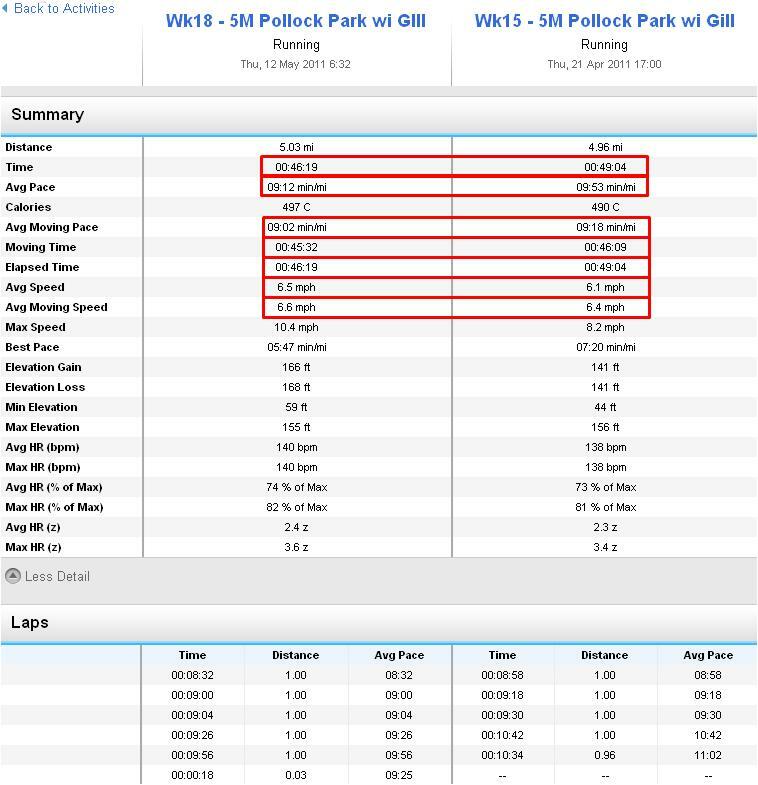 We’ve been out 3 times now, 2 x 5 mile steady runs through Pollock Park and a 4.75 mile speed session in Bella park last week. The first time we went out we did a 5 mile route through Pollock Park, in the park up and down the hills, then out at the golf club exit. Gill was going at a steady pace and needed to walk about 3 miles in, but I found out later that she had been pushing it faster than she wanted to because she ‘didn’t want to slow me down’. I’ve tried to explain to her that I only push it and run fast when I’m on my own, and when I run with others it’s more about socialising and I’ll run at any pace. I know what it’s like to feel like you have to run at a pace which is just above your comfort zone because someone you are running with is going too fast and not considering how you feel. It’s not nice and can lead you to hate running! I’d much rather go at any pace and get the crack. If it means I run 2 minute miles slower than my fast pace, then I don’t mind. The key thing for me to be running with others is that we both enjoy it and we chat about anything and everything. I learned all this from my friend Jackie. Slow and steady wins the race!! Everyone runs at a different pace and it’s important if you feel out of breath when you run, to consider slowing your overall pace down. Beginners to running, and people coming back to running, tend to try to run too fast. Relax. Slow down. Concentrate on breathing from deep down in your belly, and if you have to, take walking breaks. Try to enjoy being out there. For Gill, all I think she needs to do is lower the pace for the whole run. She started fast on both 5 mile runs, then needed a break and to walk at two points. I don’t mind this (even though it was pouring! ), but I think the reason she needed the rest was because she had over done the pace at the start. Even if she just lowered her pace to about 9:00 min miles, or 9:30 she would have an easier run and she would enjoy it more. She would probably not need to take breaks and would finish the whole run in close to the same time as she did today, only she would have run the whole way. I’d much rather run a whole route slower over and finish knowing I’d run the whole way and felt comfortable, rather than going out too fast, feeling like crap, then having to walk run the route. The more Gill runs, the easier it will become. Over weeks of running, she should get more comfortable with running and her pace should naturally increase. Her body will get used to running and she’ll be rewarded with feeling good during and after runs. Today we were about a mile from Bella and Gill told me to run on without her. She is clearly feeling the pressure of running with someone who she thinks is faster than her. I stayed with her and walked for a few minutes, chatting. Then once she was ready we ran again. I need her to know that I don’t care about pace and that we’ll run at her pace. It doesn’t matter. It’s much more important to be out there running and having fun, than killing yourself and not enjoying it. I also said that I’m training for a 40 mile ultra marathon, so my pace will need to reduce so that I finish it comfrotably. Running with other people makes me sensible and stops me running extra fast when I should be running slow and steady. There can be a risk if you push yourself too much or have goals which are too high, is that you will end up hating running, and give up. Don’t worry about what other people think. If they want to run with you, they will, and if they like you they won’t care how fast or slow you go. This entry was posted in Run and tagged gill, glasgow, Hills, miles, park, pollock, run, running, steady. Bookmark the permalink. great attitude, there’s always someone faster so from the start running has to be about your own experience. good luck to gill too.